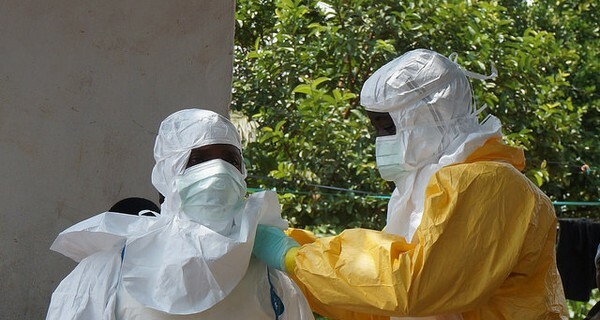 The Ebola outbreak in 2014 was devastating in West Africa, claiming an estimated 10,000 lives. This highly virulent epidemic was largely contained through the brave efforts of numerous local and international medical professionals and, near the height of the outbreak in September, Médecins Sans Frontières (MSF; Doctors Without Borders) had set up a treatment centre in Sierra Leone to keep exposed patients quarantined in efforts to contain the spread. Dr Achar, working with the MSF team, was constantly in and out of this treatment centre. He was wearing a ‘moon suit’ – a protective polythene outfit designed to keep him safe from the Ebola virus. While necessary, the moon suit severely hindered Dr Achar’s actions, and when sharing notes on patients he was resorting to shouting this information over the enclosure fence. The paper he used was possibly infected, and had to be burned. Ivan Gayton, at the MSF HQ in London, was tasked with finding a solution. Ivan contacted Google and the company responded in force. Soon, Google had developed and deployed a specialised Android tablet to the MSF team. The tablet is polycarbonate and can be dipped in chlorine, allowing the device to be sterilised when leaving the containment zones. Data is communicated wirelessly, allowing Dr Achar and colleagues to distribute and receive patient notes and results in real time with the outside. Both tablet and server run on lithium ion batteries – much like a smartphone – allowing the system to maintain connection even off the grid. This fast, humanitarian response by Google to a dire need continues to be used today in West Africa. The system will continue to be immensely valuable in other epidemics, and in other high-risk environments like research labs and clinical trials. Image 'Sierra Leone: into the Ebola epicentre' courtesy of European Commission DG ECHO.